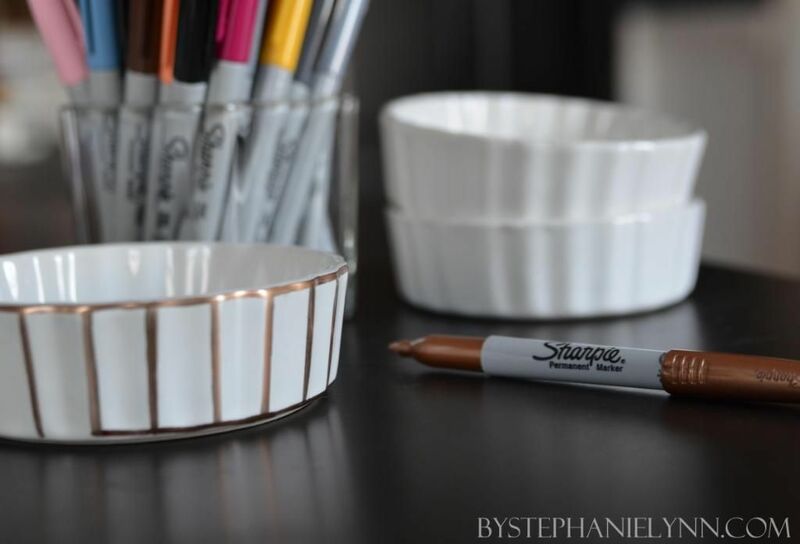 This post brought to you by Sharpie®. All opinions are 100% mine. so that every color you could ever want is at your fingertips. are now available in gold, silver and bronze. and seem to work best when doing a project like this, free handed. Each dish was cleaned and thoroughly dried prior to starting. Then I just got a little creative with the bronze and silver Sharpie® markers. and baked at 350° for 30 minutes to set the design. to an otherwise plain and simple dish. 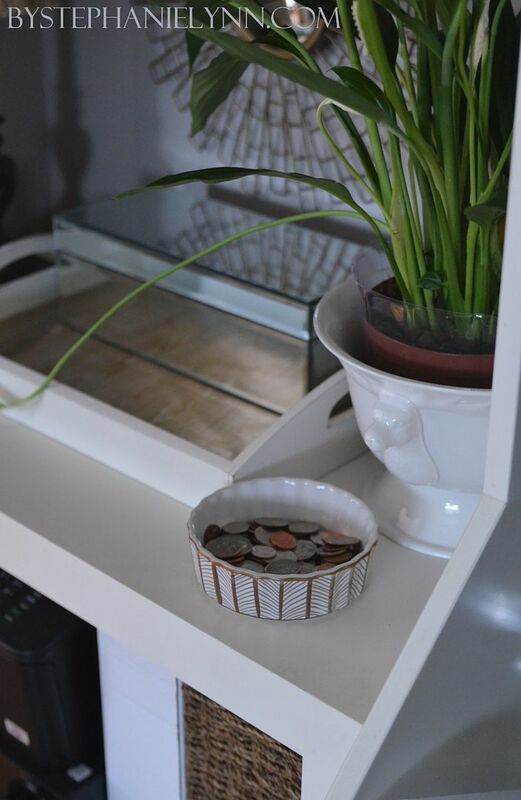 I already put one to good use as a little ‘catch all’ by our keys – to hold our loose change. I think the rest will make perfect presentations for some homemade tasty treats. As to whether the design will be permanent or not will depend on individual piece, how it is being used and how it is cared for – so be sure to do a test run before giving, as the results do vary. If the pieces are being used for actual food purposes – I highly suggest they be hand-washed. I didn’t even know sharpie was on pinterest. Thanks for posting. And I love the metallic bronze on the bowls! You did a beautiful design! Those metallics are super cool. What a great idea! I have a ton of sharpies I need to put to use. That is the cutest idea! They always have dishes like these at Dollar Tree & I always wonder what you could do with them! Great post!!! I love these! You did an amazing job on the detail! Thanks for sharing! Have a Happy Thanksgiving! 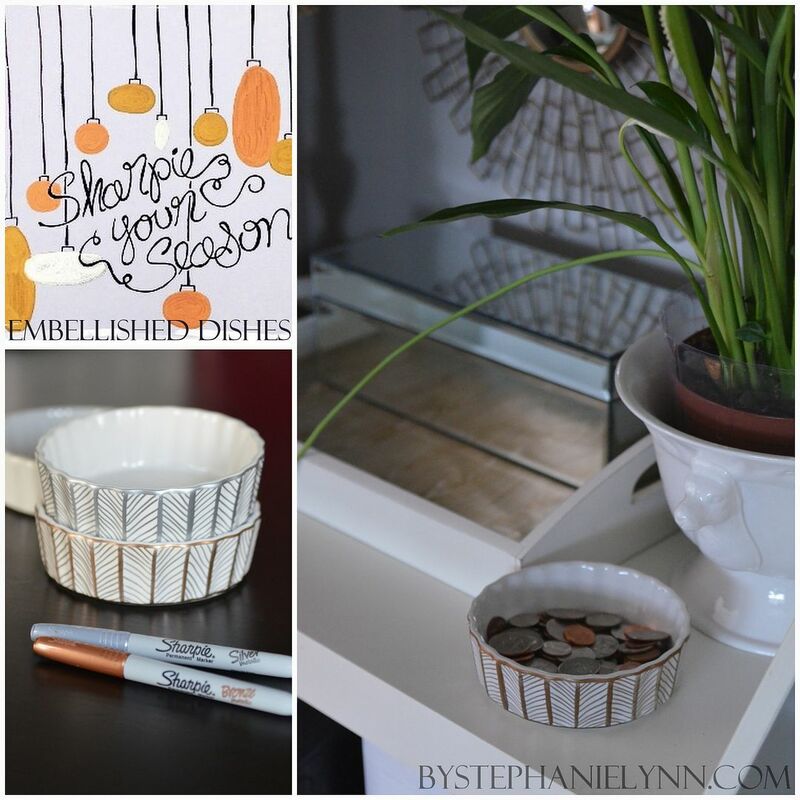 What a beautiful affordable idea! Love it! Oh, the possibilities! Thank you for the baking tips! Thanks for the great idea!!! Gotta try it!!! Cool idea!!! I love what you did with them! They look beautiful! I have heard the Sharpies don’t last but ceramic markers do. Just a tip in case you want to amke more creative dishes! What a great idea, would have never thought of that! If you bake them like you would for ceramic markers they do. put in oven, then turn on oven to 350 when it reaches temp cook for 40 minutes. Turn oven off and let cool. I can’t say I have scrubbed them but have used my finger and rubbed hard and it doesn’t come off. Make sure you start with a clean piece. I use rubbing alcohol to clean it with. Doesn’t work for food items. Did it, baked it, and all the marking ended up oozing all over when the food hit the plate. When I hand-washed it all the sharpie came off. 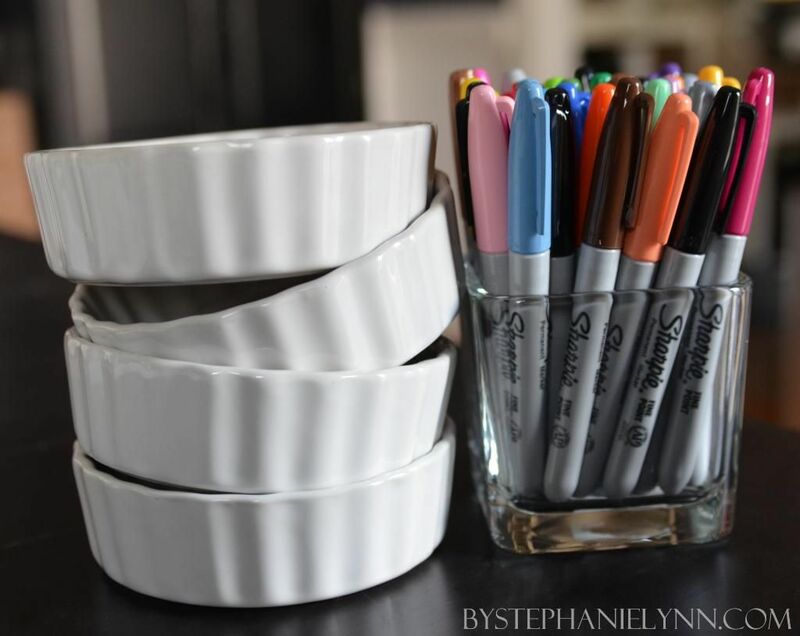 Hi Toni – I would be a little cautious having the decorated surface come in direct contact with food – as many porcelain markers that are made specifically for this purpose state they are not recommend for use on surfaces that come in contact with food. I think decorating the outside of a mug or bowl, or even the underside of a dish is ok though. Would you mind sharing what type of material the dishes you were working with were made of – just as a heads up to others. As mentioned above – as to whether the design will be permanent or not will depend on individual piece, how it is being used and how it is cared for – so I highly suggest to do a test run before actually using the piece or giving it as a gift, as the results do vary. This was a lovely post! 🙂 I can’t wait to get my set of Sharpie and start with creating my own personalized stuff, yet after going through a few blogs I have just one question in mind. 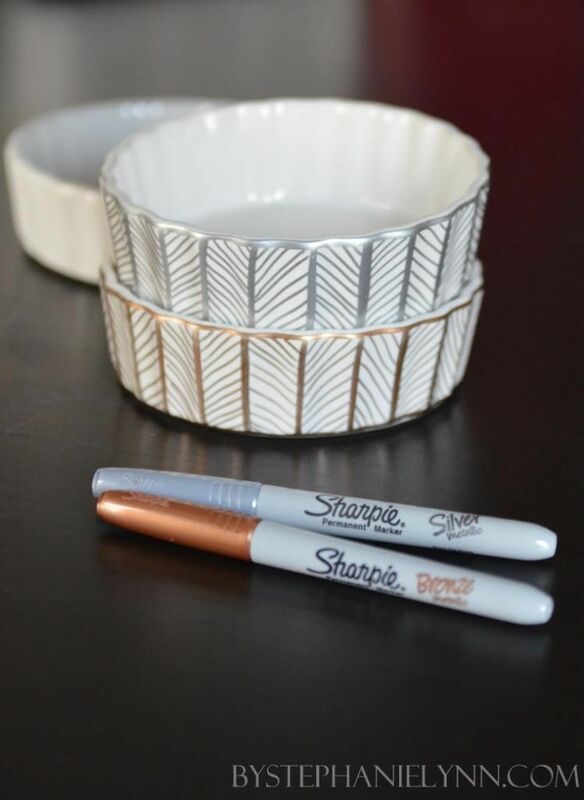 It would be great if you could help a bit – what kind of dish material is best for Sharpie? 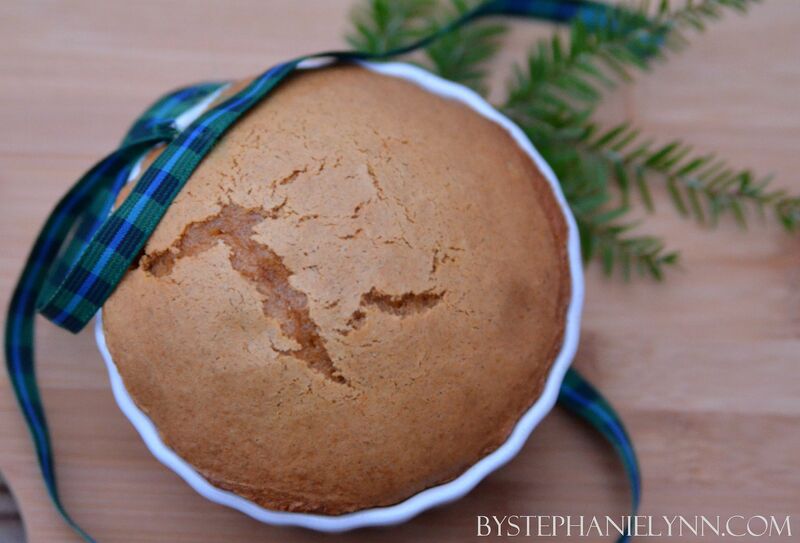 I have a question – what about the next time you bake the dish? Will the design withstand more heat from time to time. Can they be microwaved?